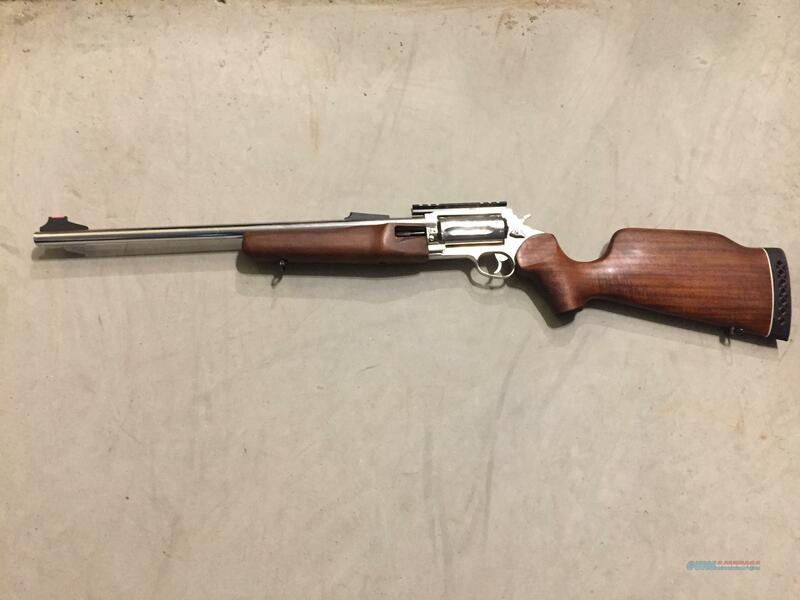 Description: This Rossi Circuit Judge in .45 Long Colt / .410 gauge is in very good condition. It has a 18.5" stainless barrel, stainless 5 shot cylinder, optics rail, fiber optic front sight, and hard wood stock. From bear to bird, this rifle/shotgun has the ability to do it all. Insured shipping is $35.00 to the continental U.S. and no card fees added at Deals on Guns. Rossi website; The Rossi Circuit Judge® is versatility at its finest. Based on the legendary Taurus Judge® revolver, this powerful rifle has the ability to fire both 410 shotshells and 45 Long Colt ammunition without changing cylinders or barrels. Whether for home defense, hog hunting or plinking, the Circuit Judge will quickly become your go-to gun. Model: SCJ4510SS Status: Available Caliber: 45 Colt / 410-ga. Capacity: 5 Shot Barrel Length: 18.5" Action: DA/SA Finish: Polished Stainless UPC: 6-62205-98556-0 Style: Full MSRP: $739.00 Weight: 5.3 lbs.